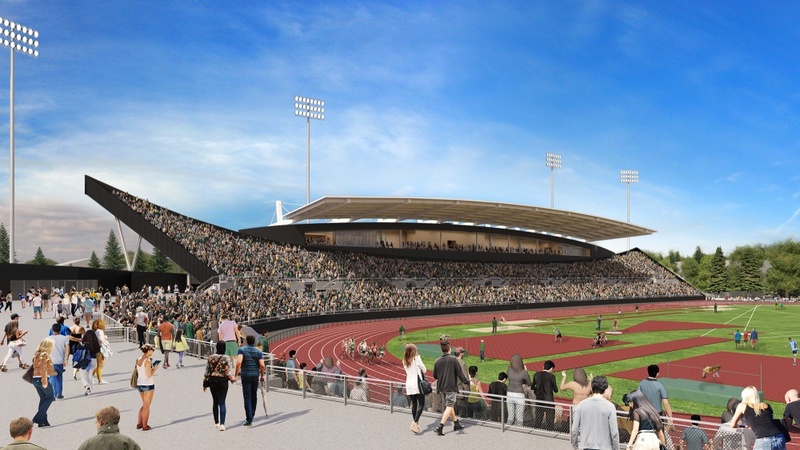 With the renovation of historic Hayward Field anticipated to begin this fall, the Board of Trustees of the University of Oregon has approved a recommendation to name the completed facility in honor of the alum, coach and innovator who brought the iconic venue to national prominence — Bill Bowerman. The recommendation, submitted by President Michael Schill in coordination with University Advancement and the Department of Intercollegiate Athletics, names the completed renovation the Bowerman Track and Field Complex. Hayward Field will now be known as Hayward Field at the Bowerman Track and Field Complex. The UO Foundation, the nonprofit organization responsible for receiving, investing and distributing private gifts to benefit the university, is managing the project and associated costs. The renovation will be funded entirely by private gifts. “The renovation will significantly enhance both academic and athletic opportunities, creating an environment where all users will thrive,” UO Foundation President and CEO Paul Weinhold said. 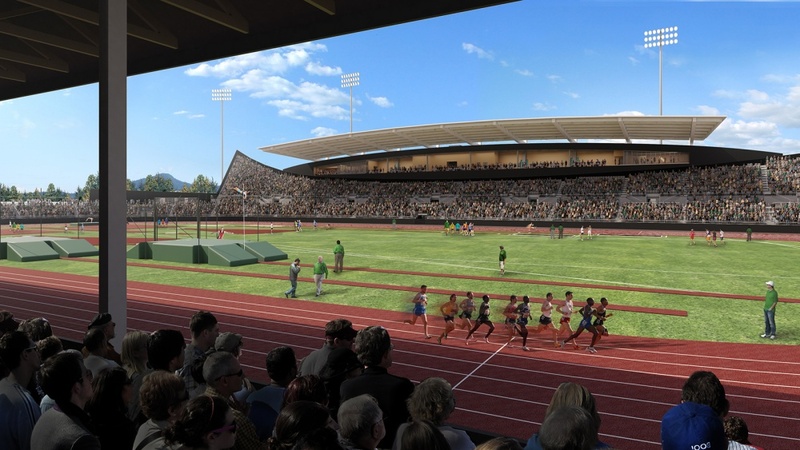 As the first comprehensive renovation of all Hayward Field facilities, the project will be conducted in two phases. The first phase will take place from September 2016 to May 2017 and entails renovation of the east grandstand and construction of the south concourse. The east grandstand renovation will use as much of the existing structure as possible, while improving accessibility and amenities and updating key features, such as renovated seating, restrooms and storage space. 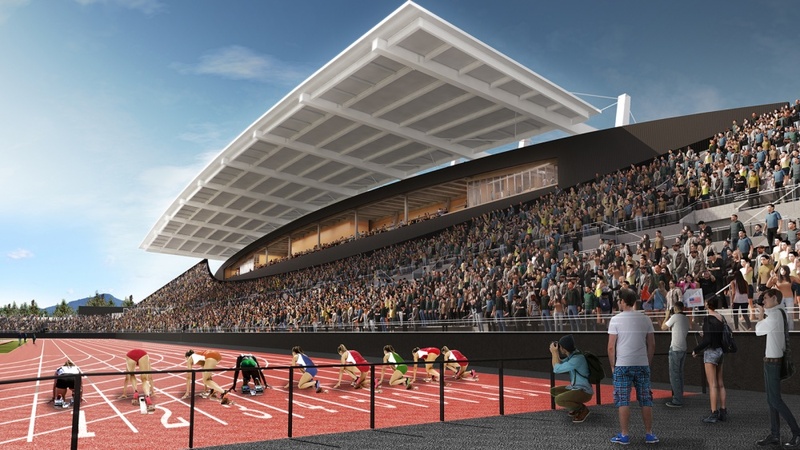 Construction will pause in May 2017 to accommodate events such as the Pac-12 Championships, OSAA Track and Field Championships, Pre Classic and NCAA Championships. In late June 2017, the project will move into its second phase, which includes demolition of the existing west grandstand and Bowerman Building and construction of a new west grandstand. A new dedicated academic research facility within the west grandstand will nearly double the space currently available for UO human physiology students and faculty currently using the Bowerman Building. The current indoor practice facility in the west grandstand will be expanded in the new grandstand, including locker rooms, treatment and team spaces, a weight room, coaches’ areas, a 140-meter training track and an indoor pole vault, long jump and throws area. The renovation will increase Hayward Field’s permanent seating to approximately 12,100 and is scheduled for substantial completion in May 2018, prior to the NCAA Track and Field Championships. Trustees also received updates on diversity initiatives, including the recently finalized IDEAL framework and the workgroups focusing on requests from the Black Student Task Force. Additionally, the Information Services leadership team provided an overview of progress on information technology strategic planning. A new website has been launched that provides updates and information on the effort. On the heels of his June 1 investiture, Schill also provided an overview of the academic year. Authorization of $966.1 million in anticipated expenditures the upcoming academic year. Naming the new home of the Oregon Bach Festival Berwick Hall. A new six-year multimedia license agreement between IMG College LLC and the Department of Intercollegiate Athletics that provides exclusive rights for such things as radio, signage, impacts and opportunities at events, and placement of advertisements/sponsorships on goducks.com.